In a major setback to the bar owners in Kerala, the Supreme Court upheld the controversial Abkari policy for the year 2014-2015 framed by the Kerala Government restricting the issuance of bar licenses (FL-3) to five-star hotels in the State to serve alcohol to the public, and not to renew the existing bar licences issued to any of the other hotels. Additionally, the Government had decided to close down 10% of outlets out of 338 FL-1 outlets of Kerala State Beverages Corporation and 46 outlets of Consumer Fed each year from 2nd October, 2014 onwards. The Supreme Court, held that the Company Judge cannot interfere in a proceedings by a secured creditor to realize its secured interests as per provisions of the SARFAESI Act. Apex Court bench comprising of Justices Vikramajit Sen and Shiva Kirti Singh, in Pegasus Assets Reconstruction P. Ltd. Vs. M/s. Haryana Concast Limited has settled the legal position in this regard. The Apex Court in LIC of India vs. Insure Policy plus Services Pvt. Ltd upheld the Bombay High Court ruling that the insurance policies issued by LIC are transferable and assignable in accordance with the provisions of the Insurance Act, 1938 and in terms of the contract of Life insurance. 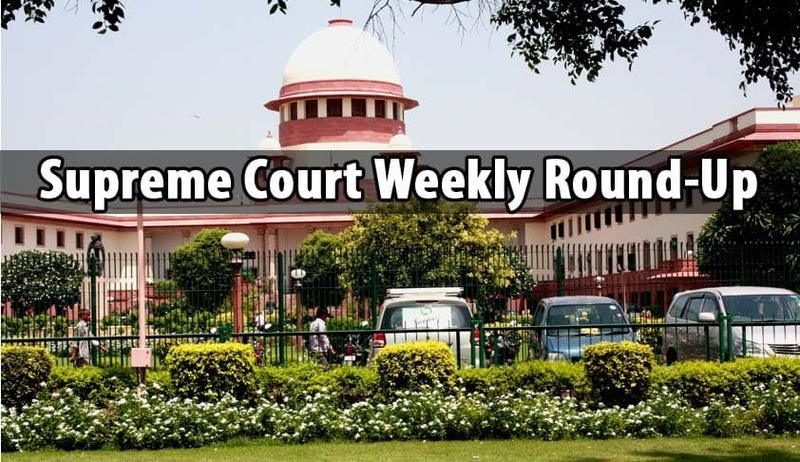 Apex Court bench comprising of Justices Vikramajit Sen and Shiva Kirti Singh said that such transfers or assignments does not public policy as the general global practice is to permit assignments of insurance policies. The Supreme Court’s Vacation Bench comprising Justices SA Bobde and Prafulla C Pant, on Monday denied immediate relief of The 11 convicted encounter cops, whose sentences were suspended by Maharashtra Government in an atrocious order on 2 December and who were directed to surrender before 4 January by the Bombay High Court.